The bright azure sea, warm sun, and 800 meters of clean white sandy beaches come together to create the paradise that is Sheraton Sharm Hotel, Resort and Villas. Sheraton Sharm Hotel Resort Sharm El Sheikh is nestled on the east shore of the southern tip of the Sinai Peninsula on one of the world’s most beautiful coral reefs. Located at Al Pasha Coast, Sheraton Sharm Hotel Resort Sharm El Sheikh is just four kilometers from the nightlife of Na'ama Bay and 10 minutes from Sharm El Sheikh International Airport. 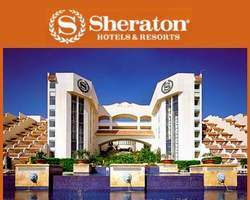 Sheraton Sharm Hotel Resort Sharm El Sheikh 835 spacious guest rooms and suites are a haven of comfort and relaxation. Take in the view from your private terrace, order room service, or connect with home using the High Speed Internet Access. Settle in for a relaxing evening in one of Sheraton Sharm Hotel Resort Sharm El Sheikh guest rooms or suites, filled with warmth and comfort. Select from 282 beautiful seafront rooms and 18 lavish suites located in the main building, or 423 deluxe rooms situated in the resort area. 112 exotic villas offer additional style and services that exhibit the true meaning of relaxation. Gather with friends and family to explore an array of cuisine options in Sheraton Sharm Hotel Resort Sharm El Sheikh inspiring restaurants and bars. Discover the mystical mood of the Indian cuisine at Tamarind restaurant, where every dish speaks for itself. Savor fine Italian delicacies indoors or in the romantic setting of the terrace at Portofino. The White Cruiser offers unique buffets for breakfast, lunch, and dinner in a relaxed terrace setting. Find inspiration for your event in Sheraton Sharm Hotel Resort Sharm El Sheikh four state-of-the-art meeting rooms, incorporating a total of 4,251 square feet of space. Whether you’re hosting a coffee break or a gala dinner, Sheraton Sharm Hotel Resort Sharm El Sheikh offer a great setting and professional, friendly service. Sheraton Sharm Hotel Resort Sharm El Sheikh exotic location is ideal for dream weddings. Sheraton Sharm Hotel Resort Sharm El Sheikh will work with you to ensure that your dream becomes a reality. Sheraton Sharm Hotel Resort Sharm El Sheikh dedicated team members are ready to cater to your every need, from menu tasting to arranging accommodations for your guests. A warm welcome and friendly service are just the beginning. Sheraton Sharm Hotel Resort Sharm El Sheikh professional staff will do everything Sheraton Sharm Hotel Resort Sharm El Sheikh can to ensure your stay is memorable. Discover endless opportunities for fun and fitness with a choice of water sports and daily entertainment programs. Take a quiet walk through the spectacular garden promenade. Share a romantic moment with a loved one at Sheraton Sharm Hotel Resort Sharm El Sheikh private beach. Or take part in one of the most spectacular dive sites in the world. Treat yourself to a day of wellness and beauty at Sheraton Sharm Thalasso Center – the region's largest and most comprehensive facility for Thalasso therapy. Unwind in the Jacuzzi, relax with a professional massage, or enjoy an aqua-medic treatment. The choice is yours.